Summary: Living in Winnipeg, Manitoba in the 1930s, Annette is the daughter of two Russian Jews eager to return home to Joseph Stalin’s communist Russia. Used to living in Canada, Annette is less than enthusiastic about being uprooted, but the hope and optimism Russia harbours for the future under their new regime is contagious. The start of World War II begins to reveal all is not what it seems though, and as Annette grows she is faced with reconciling the propaganda with the truth. Surviving the war is an achievement in itself as it comes at a very high personal cost for Annette, except the struggle isn’t over as Stalin’s regime proves itself to be harsh and anti-Semitic after all. About to lose another loved one due to charges of treason, Annette makes a drastic choice to hang on to what she has in anyway she can. Review: As an adult Annette reflects back on her life and the choices she has made, she finds herself going back to the memories of her childhood up to her thirties. Because The Knife Sharpener’s Bell by Rhea Tregebov is a work of historical fiction, there are so many moments when it is clear the decisions made are the direct downfall in the lives of the characters. If Annette’s father hadn’t gone back to Russia to inquire about passports for his family, if Annette’s mother hadn’t been so determined to go back to Odessa and then so stubborn about staying, if Vladimir had never met Anatoly, everything would have been different. Lives would have been saved and paths changed, but as Annette knows from years of examining her choices, if she unravelled them even a little bit, her daughter would never have existed. Still, Tregebov’s examination of these choices and the role they played is fascinating as she covers the role of decisions we have no control over in our lives and contrasts them with the decisions we make ourselves. Because she is looking back on her life, Annette is a wonderfully self-aware character who is able to consider all of these choices in her life. When her brother comes from Canada to offer Annette a choice after the death of her parents, I was still surprised by her decision even though it was my second time reading the book. Like Graffiti Knight by Karen Bass, I also loved the historical aspect because I learned a great deal. Annette’s parents are so incredibly hopeful that Stalin’s Russia is one where Jews are considered equal and everyone is working together for the betterment of the people. It is heart-breaking to find out how wrong they are, but witnessing the situation from Annette’s point-of-view is an eye-opening experience. Annette herself is a creative thinker with a great deal of heart, and while I was shocked by her actions at times Tregelov does an excellent job of showing what motivates her. Tregebov’s stylistic choice of having Annette considering her life from the viewpoint of old age makes her book accessible to both teen and adult audiences, but I like it for older teens as a well-written, contemplative read that would do well in a Canadian Literature class. 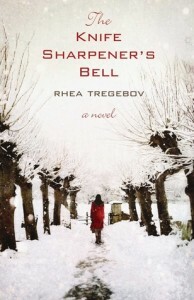 The Knife Sharpener’s Bell by Rhea Tregebov is published by Coteau Books, (2009).